While in Sagaponeck, NY last weekend celebrating Grandma’s 85th birthday, my cousins and I stumbled upon a hidden gem down a small ally way. 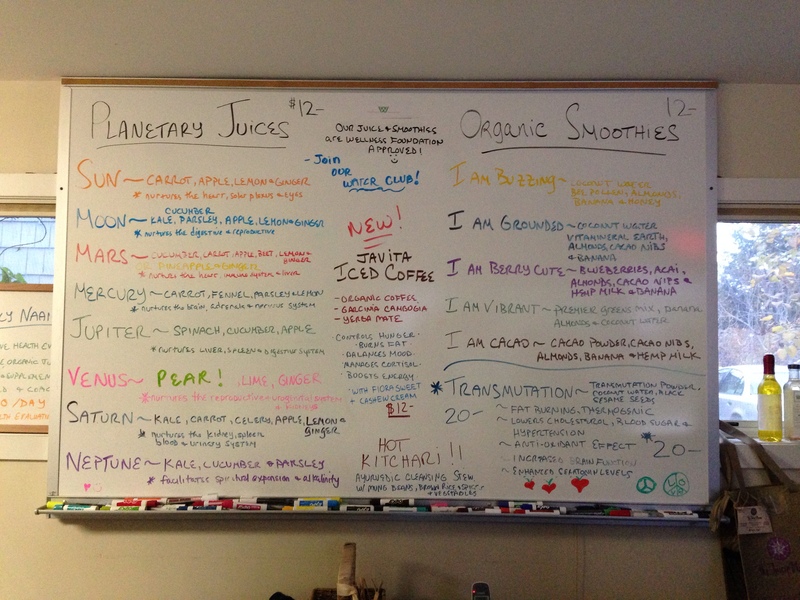 The Juicy Naam was a small store filled with awesomeness – there were superfood supplements, a small kitchen, tons of raw, dark chocolate, and a huge white board that hung on the wall filled with delicious smoothie and juice recipes. It was official, I was in heaven. Of course, I wanted to try all of the drinks, but one name caught my eye – “Golden Milk”. At some point in the past years of studying and learning about healing foods, I had heard about golden milk, but never got a chance to try it. With a chill in the air that night, I decided it was the perfect time to do so. The man behind the counter was glowing with love, and as he placed each ingredient into the blender, he told us what they were. Turmeric, cashew milk, honey… the list went on. I quickly wrote it down in my brain so I could try a version of golden milk when I got home. Place all of your ingredients into a blender and blend on high for about 1 minute. Warm mixture over a low heat (try not to boil). Turmeric is a super-herb. It has been used in Chinese and Indian healing for thousands of years to clear infections and imbalances both inside and outside the body. Turmeric is loaded with antioxidants, which help fight imbalance and disease throughout the body. Turmeric is also recognized as one of the most powerful anti-inflammatory foods around. Inflammation is the root of most (if not all) illness and disease, so anti-inflammatory foods are a wonderful way to support your immune system, improve digestion, relieve joint pain, fight cancer, improve brain function, promote vibrant skin, support a healthy heart, and many other things. 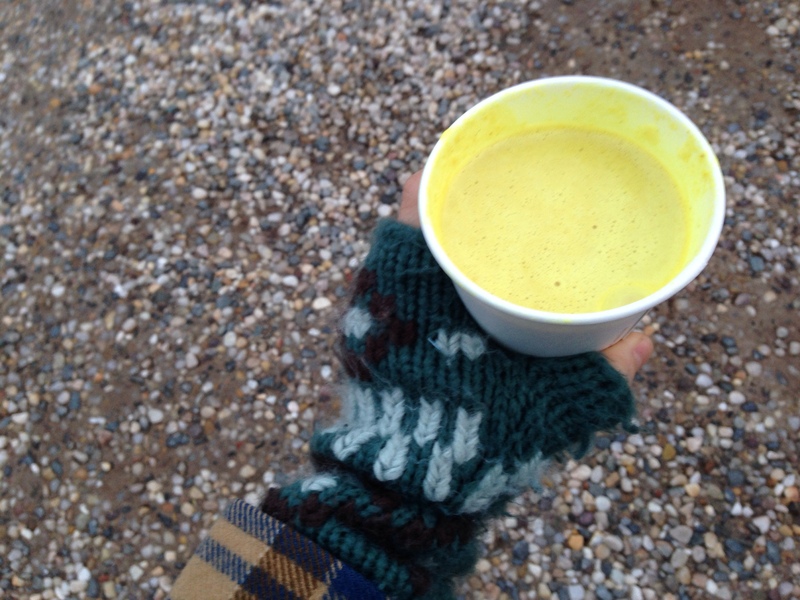 Plus, golden milk is a warm and nourishing drink, particularly good for the chilly winter months we have ahead of us. Tags: ayurveda, golden milk, healing, herbal, herbs, turmeric. Bookmark the permalink. I’ve done something similar for a while and love it. 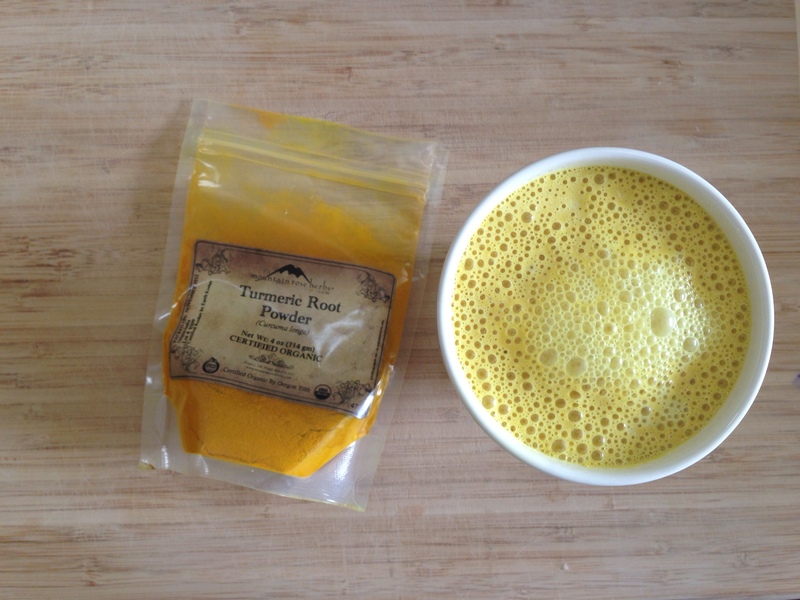 Turmeric tea – turmeric root, ginger and lemon…go light on the lemon. Sounds delicious!! Thanks for sharing! I will have to try it… (and thanks for the suggestions on how to prevent turmeric fails).